I had recently heard the claim that West Palm Beach had excellent diving. Guide books claim that it has some of the best drift diving in the world. After diving West Palm, I understand the reason for the reputation. It is truly world-class drift diving. The reefs are majestic and rugged. The Gulf Stream provides the drift dive. As a beginner diver, I have found that drift diving is what I would expect the weightlessness of moon-walking or space-walking to be like. 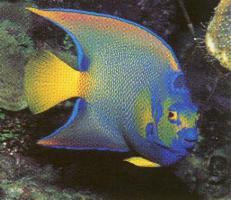 It requires almost no energy, yet you float along and observe the fabulous beauty of the tropical fish and reefs. The Stream pushes warm water closer to the shore here than anywhere else in Florida. The water is very clear (we have 40-50 feet of visibility). And the reefs here are home to more species of fish than anywhere else in Florida, as well. 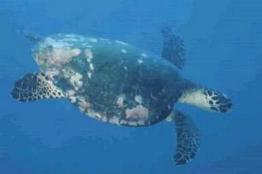 The area is well-known for having a large sea turtle population (see photo). In 24 hours, I enjoy 6 dives, ranging in depth from 25 to 80 feet. It is exhausting, but nevertheless exhilarating. It is part of a chartered boat—a dive trip arranged by Water World in Gainesville FL, where I live. My dive boat is good and contains a helpful crew. On Saturday afternoon, we dive the Breakers Reef. Here, we see an impressive 3- to 15-foot ledge system. In all, the reef is 2 miles long. Our next dive is at Flower Gardens Reef. On both of these dives, we see large fish, a large sea turtle, and I have fun watching our dive masters catch several lobster. .
At 7 p.m., I go on two night dives—my first experience with such diving. At first, I am rather apprehensive: Would it be so dark that I would suffer from claustrophobia? Would I be able to signal quickly to my dive buddy if I was in distress? Would I be able to follow the group in total darkness? But because there were 8-10 of us, the large number of flashlights makes for an easy and extremely enjoyable night drift dive. I notice that even more so than daylight drift diving, night drift dives truly provide what I assume it is like to go moon-walking: Weightlessness and darkness. It was wonderful to be able to shine my flashlight on the colorful tropical fish (see photo below), and there is a much different experience at night in the same dive location, because different forms of marine life come out. For example, we see a big moray eel (photo above right) squiggling about on the ocean floor, and many of us shine our lights on it to make it seem like it was the star of a show on a spot-lighted stage. 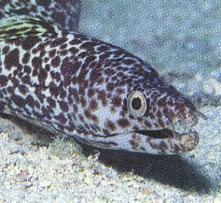 The night dives are at Breakers Reef and Bath and Tennis Reef. We find milder currents at the latter location, which gives us more time to enjoy the tropical marine life. On Sunday, we log two more dives in the early morning, at Breakers and Flower Gardens. As I ascend on my final dive, I am fortunate to spot a lovely, graceful jellyfish. Earlier, I spotted two enormous, bright blue parrot fish at the bottom, and a good size sting ray. We escape from West Palm as the fearsome Hurricane Floyd (much bigger than the very destructive Hurricane Andrew) was bearing down on us with Category 4, 145 mph winds ranging out over 125 miles. Fortunately, Floyd veers away from West Palm, so the city escapes significant damage, as far as I know.